4ELEMENTS Black Ducks new revolutionary heavy duty seat cover fabric. SAMPLE IMAGES of Motorcycle, Quad, UTV, Mower and Construction machinery Covers by Topaz Global. Home/PRODUCTS/AUTOMOTIVE/AUTOMOTIVE PRODUCT RANGE/4WD'S, CARS, UTES & COMMERCIALS & BUSES/Suitable for FORD /Suitable for FORD UTES 4x2 & 4x4/Suitable for FORD RANGER/Suitable for PX1 FORD RANGER 09/2011 - 05/2015/Suitable for XL, XLS, XLT & WILDTRAK PX RANGER WITH SEAT- FITTED SIDE AIR BAGS 07/2011 - 05/2015/Suitable for SINGLE CABS & SINGLE CAB/CHASIS PX RANGER with SEAT- FITTED SIDE AIRBAGS/PX1 Front Driver & Passenger bucket seats Ford Ranger PX1 07/2011 - 05/2015 XL, XLS, XLT & WILDTRAK from 07/2011 - 05/2015 with Seat-Fitted Airbags Black Duck Seat Covers. 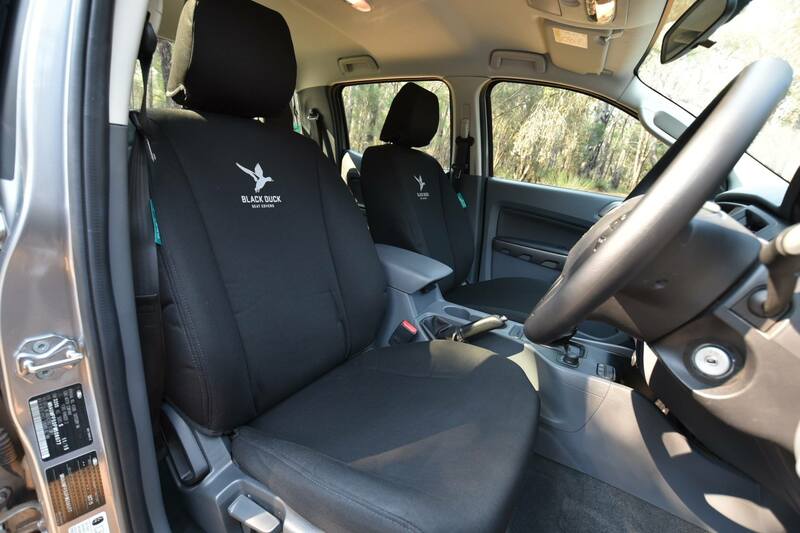 PX1 Front Driver & Passenger bucket seats Ford Ranger PX1 07/2011 - 05/2015 XL, XLS, XLT & WILDTRAK from 07/2011 - 05/2015 with Seat-Fitted Airbags Black Duck Seat Covers. FREE EXPRESS (INSURED) DELIVERY ON ALL BLACK DUCK SEAT COVERS. 2-3 DAYS on stocked items. 5-10 days on non stocked items. We guarantee you will receive the correct BLACK DUCK seat covers to fit your PX1 FORD RANGER when you fill out our online "Confirmation Form". A link to this form is emailed along with your Tax Invoice immediately after your payment is received. SELECT for CANVAS, DENIM or the new 4ELEMENTS fabric and COLOUR. NOTE: Your covers may not be in stock (80% are in stock). Dispatch of orders MAY BE UP TO 3 WEEKS. 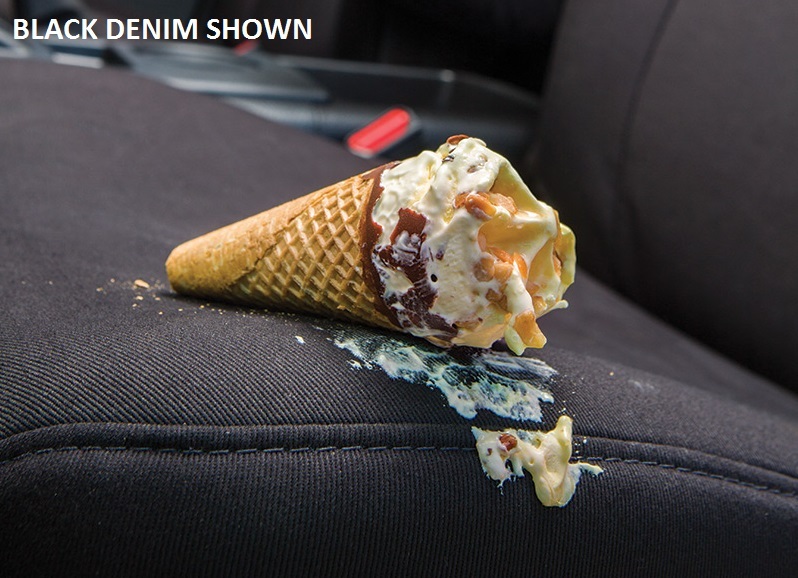 Denim is not as durable as Canvas and is recommended for recreational users only. For CANVAS covers ONLY not DENIM or 4ELEMENTS. Select for a REINFORCING PATCH sewn onto the BASE of the front seat(s) cover. NOTE: CUSTOM ORDER 2-3 weeks for delivery. SHIPPING WARRANTIES and RETURNS (BD). 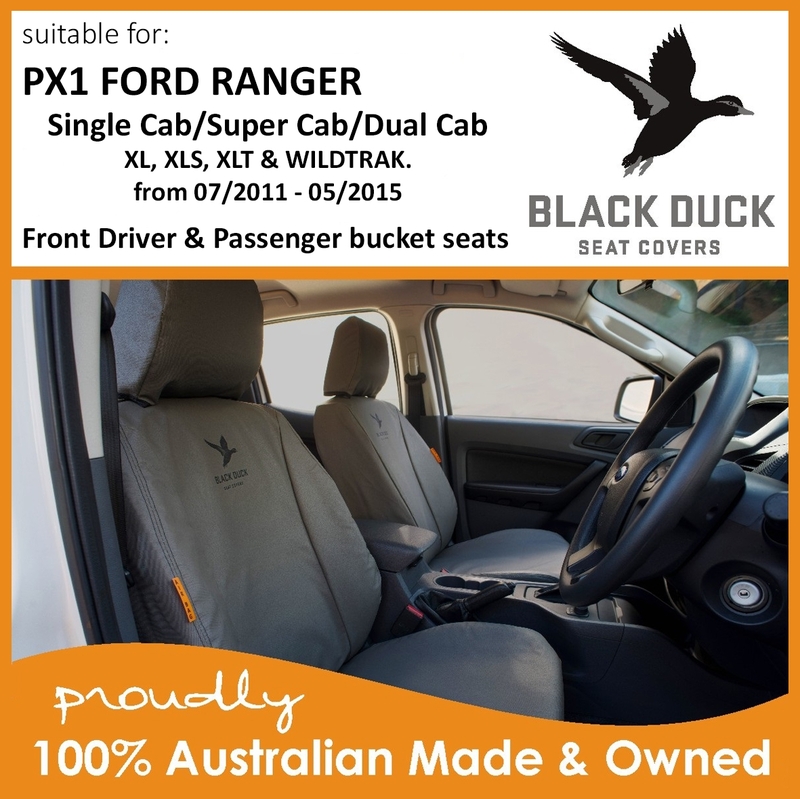 Black Duck Canvas Seat Covers - maximum seat protection for your Ford Ranger PX1, including models XL, XLS, XLT, WILDTRAK Dual Cab/Super Cab and Hi Rider, we offer colour & fabric selection, the largest range & the best prices in Australia! You will save when you shop online with Miller Canvas for Australia's most popular Canvas & Denim seat covers to fit Ford Ranger PX, manufactured in Perth by Black Duck™ Canvas products. FORD RANGER PX1 09/2011 - 05/2015 including years 2011, 2012, 2013, 2014, 2015. FRONT Driver & Passenger Bucket Seats with Seat-Fitted Airbags (Air Bag Certified by an ADR Testing Authority). All Bucket seat covers are supplied with a map pocket sewn onto the rear of the back cover unless otherwise stated. All Headrests are supplied with covers unless otherwise stated. 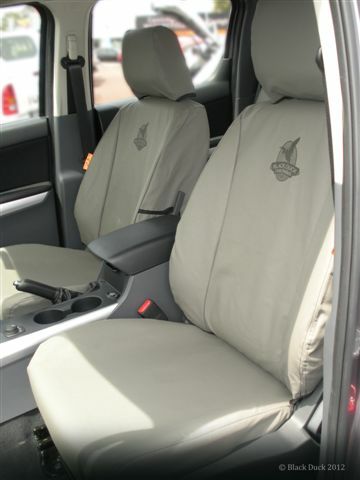 These seat covers are ADR Certified to suit your seat-fitted airbags. Only Black Duck ADR Certified Canvas & Denim seat covers should be fitted to Ford Ranger PX that are fitted with seat-airbags. The cotton/polyester mix and the treatment process has been refined over many years to come up with a water resistant product, which prevents stains on the seats from liquid spills. This also includes agents to prevent deterioration of the fabric structure from atmospheric effects, including the effects of UV radiation and mildew etc. Seats need to breathe or they become musty and lose their ‘new car’ smell. Black Duck Seat Covers keep your seats like new and increase the resale value of your Ford Ranger PX. You will find them comfortable to sit on all year round – not hot and sweaty like vinyl. Eliminate wear caused by grit and dust. The sand grit and dust that gets into everything, penetrates through cloth type seat covers and eats away at your seat trim and stitching. Black Duck Seat Covers are fully dust proof and completely eliminate grit and even fine dust from damaging your vehicle seats. Please note these are not images of Ford PX Ranger XL Single Cab/Chassis Black Duck Canvas Seat Covers. Black Duck™ Canvas Products Air Bag Compatible Canvas Seat Covers have been dynamically tested by an approved testing authority and found not to adversely affect the performance of the manufacturers seat fitted side airbag and therefore the safety of the vehicles occupants will not be compromised, providing that the seat covers are fitted correctly and in accordance with the manufacturers instructions, and that the seat covers have not been repaired or modified in any way. As the Manufacturers and sellers of this product have no control over the end use or the fitment to the vehicle, to the extent allowable by law, the Manufacturers and sellers accept no responsibility or liability for any malfunction of the vehicle occupant safety systems including the seat mounted side impact airbag system as a direct or indirect result of the incorrect fitment or unauthorized repair or modification to this product. The information contained on this page is general in nature and meant as a guide only you should always seek information from a qualified car dealer or mechanic as to what airbags are fitted to your vehicle. With over 1400 patterns its impossible to have an image of every Black Duck Seat Cover. 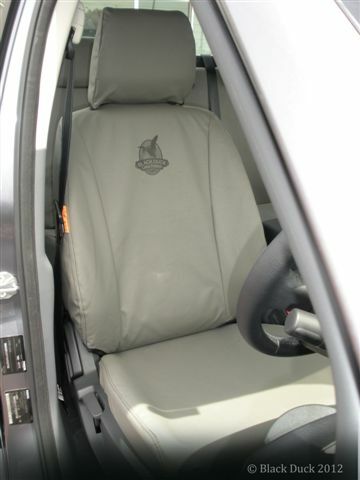 Standard Grey Seat-Airbag Certified Black Duck seat covers in Grey Canvas. Optional reinforcing patches sewn onto seat base covers, drivers side only or driver and passenger side (passenger shown). Rear Bench seat cover in Grey Canvas. Driver Bucket and Passenger 3/4 bench Grey Canvas. Image shows map pocket sewn onto the rear of most front drivers and passenger bucket seats in Grey Canvas. Image shows rear bench seat with 60/40 split base and fold down armrest in Grey Canvas. 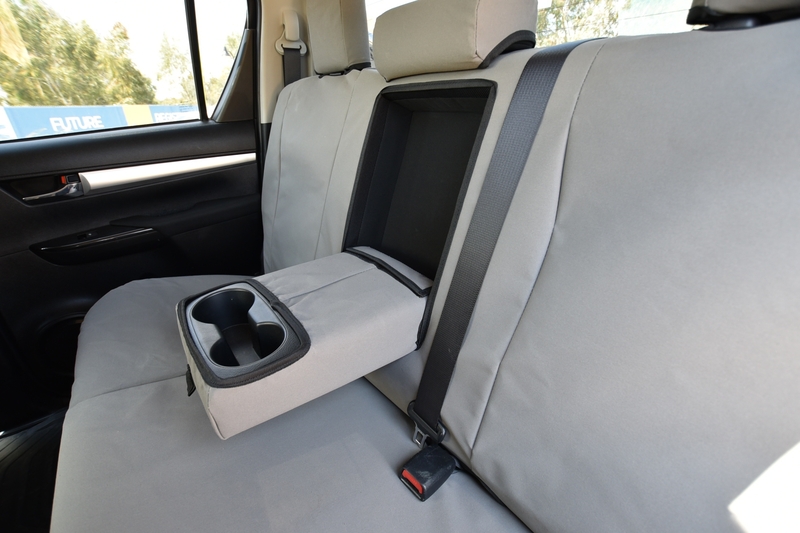 All functions of seat accessories are catered for including cup holders Grey Canvas shown. NOW AVAILABLE on ALL OUR BLACK DUCK COVERS, SIMPLY SELECT "4ELEMENTS ELBK" as an OPTION in our FABRIC & COLOUR OPTIONS SELECTOR. Currently only available in BLACK. 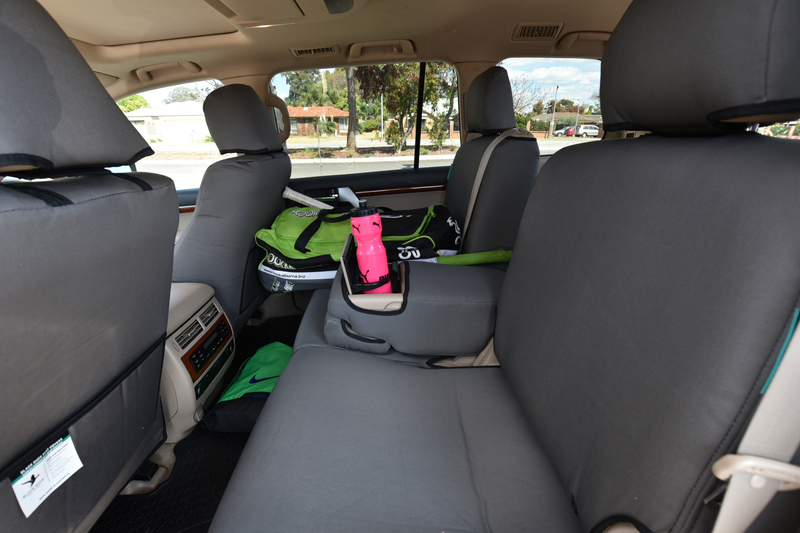 Developed exclusively for Australian conditions by Black Duck Seat Covers, the Pioneers of Seat Protection, 4ELEMENTS is a fabric that will revolutionize the seat cover industry. 4Elements by Black Duck Seat Covers is tested to withstand tough conditions without compromising on comfort. Featuring a 19.2oz Cotton Twill Composite, this is a heavyweight product with a soft and flexible feel for the ultimate in seat protection. Made from a 100% waterproof fabric that is also machine washable to keep your vehicle interiors in pristine condition – you won’t be disappointed! Black Duck's most advanced seat cover yet! SIMPLY SELECT "4ELEMENTS ELBK" in our Fabric & Colour Selector. 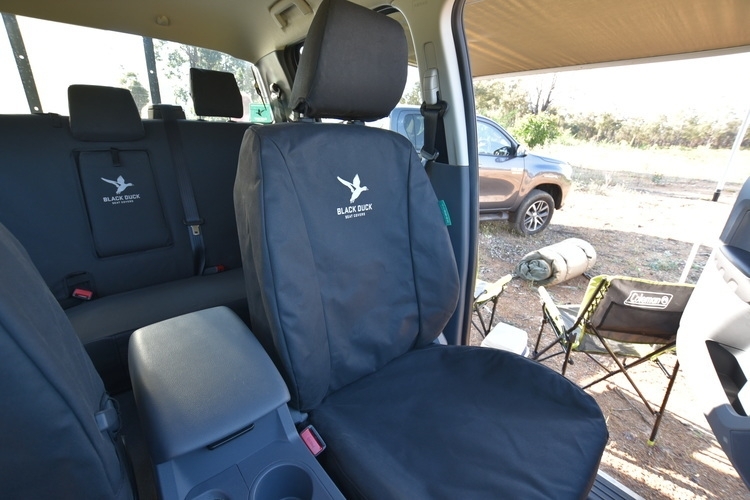 You may already know that Black Duck manufacture the BEST premium quality Canvas or Denim Seat Covers for use in Australias harsh unforgiving conditions, now with the introduction of the all-new 4ELEMENTS seat cover fabric, Black Duck has set the bar even higher. Black Duck introduced the Denim Range in 2015 to cater for those customers who wanted a more stylish, comfortable seat cover but with the same emphasis on superior quality and fit that we have become accustomed to from Black Duck. Denim covers are the same price as the standard canvas covers and are available for the entire Black Duck Range. Simply search for you particular seat or seats and SELECT DENIM AS AN OPTION in our clolour and fabic selector. (Please note Denim is generally a custom order and may take 2-3 weeks for delivery). The new Black Duck Denim material is a heavy duty twill fabric which is water resistant and UV resistant. It has a 5mm layer of high density foam for extra comfort and a soft polyester net backing to protect your seats from wear. So in effect what Black Duck have created is the same Black Duck quality with extra style and extra comfort. Layer of high-density foam for extra comfort. A soft polyester net backing to protect your seats from wear. Black Duck's Superior fit & quality. Only available in Grey or Black. Map pocket's are included on bucket seats unless otherwise indicated. Black Duck Seat Covers whether your preference is canvas or denim, add style comfort and long-term protection to any vehicle seats. Black Duck "Black" Denim fitted to a Holden Colorado Space Cab. Close up - Black Duck "Black" Denim fitted to a Holden Colorado Space Cab. NOTE: They are almost as good a fit as the original upholstery. Black Duck "Black" Denim suitable for use in a Chrysler Jeep. Black Duck "Black" Denim seat covers, suitable for use in a Toyota FJ Cruiser. 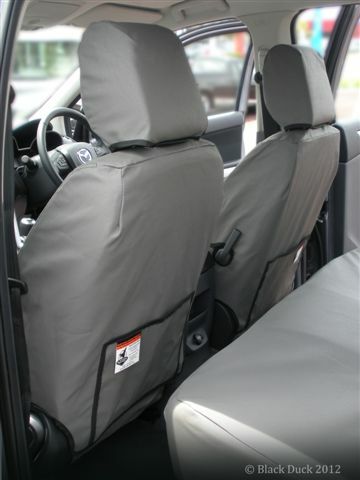 Black Duck "Grey" Denim seat covers, suitable for use in a Toyota Landcruiser. Black Duck "Grey" Denim fitted to 200 Series Landcruiser. Join the growing list of satisfied customers who have fitted a Black Duck Seat cover to their Vehicle. Please be aware that actual colours may vary from those shown on your screen. Do not assume the covers you are considering are in stock, dispatch may be up to 3 weeks form date of confirmation of your order. However 80% of orders are dispatched the same work day as confirmation and most back ordered covers take an average of 8 work days for dispatch. Black, Grey & Brown Canvas are the standard Canvas colours with Grey being the default colour and are available at the prices displayed on the website along with Grey or Black Denim. IMPORTANT: Denim is not as durable as Canvas and is recommended for recreational users only. Non-Standard Canvas coloured seat covers are custom made please allow 5-10 days for dispatch and are an additional $55.00 per row or single seat. Camo is an additional $90.00 per row or single seat. You are able to select your colour before adding to the cart. Not all covers are in stock, Black Duck have more than 1400 patterns and 15 available fabric and colour combinations. Our experience in selling Black Duck covers online for more than four years shows that approximately 40% of orders need to be manufactured. Current manufacturing time is an awsome average of 8 days. We have a flat rate shipping charge of $18.00 per order INCLUDING INSURANCE. Australia wide. Compare our prices, some companies offer free shipping then charge you for EXPRESS shipping with an additional charge for INSURANCE. Immediately after a transaction you are emailed our Tax Invoice this email is headed with a request for you to click on a link to fill out our Seat Cover Form. 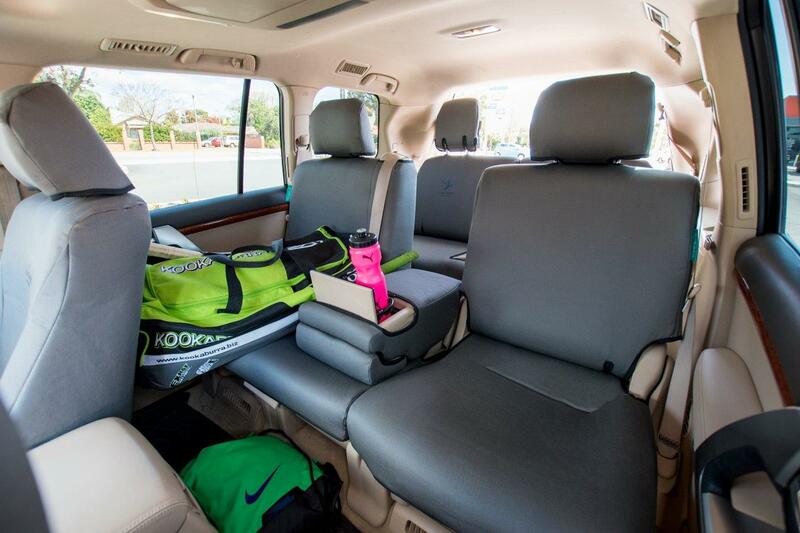 We Guarantee you will get the correct covers for your vehicle if you fill out the form with correct information about your vehicle and the seat configuration. YOUR ORDER WILL NOT BE ACTIONED UNTIL THIS FORM IS FILLED OUT CORRECTLY. Shipping in general is calculated at checkout, OUR Black Duck Seat Covers have EXPRESS DELIVERY as a standard. A delivery fee of $18.00 per order (WE ARE CURRENTLY OFFERING FREE DELIVERY) whether for a single seat cover or a complete set of covers for a Bus to ANY location within Australia. We do not ship to addresses outside Australia. Miller Canvas reserves the right to change prices for delivery at any time. Delivery is generally via Star Track Express. In most cases the article will have to be signed for. Our experience shows that the best delivery outcome is for the customer to provide a delivery address of a business they may be associated with where someone is present to accept your delivery and sign as proof of delivery between the hours of 9:00am and 5:00pm. If no one is home to accept delivery and sign as proof of delivery the courier will leave a card advising for collection at the nearest Post Office or Startrack depot or agent extra charges may apply. All orders on this website are processed within 24 hours Monday to Friday. If there are any unforeseeable delays, you will be contacted by our sales team within 2 business days. Orders will be delivered in approximately 2 - 10 business days. Our courier cannot guarantee a specific delivery date or time. If no one is present to accept the delivery, a slip will be left in the mail box so that you can negotiate with the courier a suitable arrangement for final delivery or collection, if a redelivery or change of delivery address is required then the customer is liable for any further charges. Please ensure you or someone appointed by you receives the article, inspect it and check the goods at the time of delivery. The receipt of goods must be signed for by an adult. If there is any defect or damage, (this also includes visible damage to goods or property during the course of delivery), then you must address this with the courier and have it noted on the proof of delivery docket. Title and risk of loss to all products will pass to you on delivery. Please contact us immediately via email: sales@millercanvas.com.au. Please state your name and the invoice number provided to you by Miller Canvas and clearly outline the problem. We will not accept liability for visible damage not reported within 7 days of receipt of goods. NOTE: In case of any problems with your delivery, Miller Canvas will be in direct contact with the Black Duck and the carrier to resolve the issue as quickly as possible with as little inconvenience to you. We will make every effort to contact you and keep you informed of the progress of our investigation. Seat Cover Returns & Refunds. Miller Canvas reseves the right to refuse a return for refund, each case is decided upon merrit. Returns will only be accepted if prior approval and a return reference form is given, the purchaser must contact us via email to sales@millercanvas.com.au within 7 days of delivery, with a complete detailed description of the issue, please include your Tax Invoice number. Unused and in their original condition. The Full set of covers as purchased. Accompanied by a Return Authorisation Form provided by us on approval of your Return Request Submission. The customer is responsible for all return costs. The customer must issue Miller Canvas with a tracking reference. If the item is not returned in as new condition in its original packaging along with all documentation, you may also be charged a restocking fee (to be determined upon inspection). Seat covers for older model (non-current model) vehicles, and change of mind issues will only be accepted for return at the discretion of Miller Canvas. This can be very costly, so please contact us to ask any questions about Black Duck seat covers. Miller Canvas will not refund items that have been misused, mishandled or incorrectly installed. This warranty is given by Qualtarp Pty Ltd trading as Black Duck Seat Covers (“Black Duck”). This warranty is valid for 12 months after purchase (“term of warranty”). In order to claim this warranty, you must request a return form from our customer service staff, and the product must be sent to the address provided on the form together with proof of purchase within the term of warranty. Black Duck will refund or replace the purchased product once it is received. The purchaser must bear all costs associated with the delivery and return of the product to Black Duck. Black Duck may, in certain circumstances and entirely at its discretion, reimburse the purchaser for delivery costs incurred in returning the product to Black Duck for refund or replacement. Black Duck accepts no responsibility for non-delivery of a product seeking to claim this warranty. This warranty does not apply to Loose Fit, vinyl or fabric seat covers. This warranty is in addition to rights and remedies available to you under the Competition and Consumer Act 2010 (Cth). Our goods come with guarantees that cannot be excluded under the Australian Consumer Law. You are entitled to a replacement or refund for a major failure and compensation for any other reasonably foreseeable loss or damage. You are also entitled to have the goods repaired or replaced if goods fail to be of acceptable quality and the failure does not amount to a major failure. In addition to manufacturers’ guarantees on selected products, Miller Canvas and its suppliers provide a guarantee of acceptable quality on every product, by law. You are entitled to a replacement or refund for a major failure, and to compensation for other reasonably foreseeable loss or damage. You are also entitled to have the goods repaired or replaced if the goods fail to be of acceptable quality but the failure does not amount to a major failure. OUR FOCUS is to source suppliers who ship direct to our customers saving valuable delivery time. Located in Keith in the Upper South East of South Australia, Miller Canvas have been manufacturing Tarps, Ute Canopies, Swags, Annexes & Camper Trailers and our own small range of Miller Canvas Seat Covers since 1995. We have progressively become more focused on retail rather than manufacturing and now concentrate on selling and supplying quality Australian products that are shipped direct to the customer from the supplier. In 2000 we expanded our range and became resellers of Black Duck Canvas Seat Covers, and have been selling their products online at www.millercanvas.com.au since 2013. We have over 1600 Black Duck Canvas & Denim Seat Covers listed on our site with many you won’t find on other sites. We also offer a user-friendly experience that allows you to easily choose the correct cover/s for your vehicle, select your preferred colour from a wide selection, and then proceed to the checkout where you have multiple payment options. A Tax Invoice will be emailed to you within minutes of the transaction for your convenience. As well as an extensive range of Seat Covers for all types of vehicles, Miller Canvas also offers Black Duck Vehicle Accessories, Automotive Spares, Accessories & Equipment. Besides this huge range of Vehicle Seat Covers & Accessories, Miller Canvas is also a genuine Ozroll Roller Shutter distributor, and has been selling genuine replacement parts online since 2013. We pride ourselves on providing a diverse range of products as well as a high level of customer service that has a personal touch. Within hours of receiving your order we manually cross-check all details to ensure you receive the correct items as quickly as possible. Black Duck Seat Covers Suitable for use in the following Toyota vehicles. Toyota Landcruiser 70/79 series VDJ79. Toyota Landcruiser 75 series - 76 Series and 40 series. Toyota Landcruiser 200 Series GX - GXL - VX - Sahara - Altitude. Toyota Prado 95 series - 120 series - 150 series. Toyota Hilux Workmate SR and SR5. Miller Canvas has no affiliation with or endorsement by Toyota, or any Toyota distributor or dealer. Black Duck Seat Covers suitable for use in the following Ford vehicles. Miller Canvas has no affiliation with or endorsement by Ford, or any Ford distributor or dealer. Black Duck Seat Covers suitable for use with the following Holden vehicles. Miller Canvas has no affiliation with or endorsement by Holden, or any Holden distributor or dealer. Black Duck Seat Covers suitable for use in the following Isuzu vehicles. Miller Canvas has no affiliation with or endorement by Isuzu, or any Isuzu distributor or dealer. Black Duck Seat Covers suitable for use in the following Landrover vehicles. Miller Canvas has no affiliation with or endorsement by Landrover, or any Landrover distributor or dealer. Black Duck Seat Covers suitable for use in the following Nissan vehicles. Miller Canvas has no affiliation with or endorsement by Nissan, or any Nissan distributor or dealer. Black Duck Seat Covers suitable for use in the following Mazda vehicles. Miller Canvas has no affiliation with or endorement by Mazda, or any Mazda distributor or dealer. Black Duck Seat Covers suitable for use in the following Mercedes vehicles. Miller Canvas has no affiliation with or endorsement by Mercedes, or any Mercedes distributor or dealer. Black Duck Seat Covers suitable for use in the following Mitsubishi vehicles. Miller Canvas has no affiliation with or endorement by Mitsubishi, or any Mitsubishi distributor or dealer. Black Duck Seat Covers suitable for use in the following Renault vehicles. Miller Canvas has no affiliation with or endoresment by Renault or any Renault distributor or dealer. Black Duck Seat Covers suitable for use in the following Volkswagen vehicles. Miller Canvas has no affiliation with or endoresment by Volkswagen, of or any Volkswagen distributor or dealer. Black Duck Seat Covers are suitable for use in Buses, Vans, Trucks, Tractors and various machinery including Hino, International, Iveco, Kenworth, Mack, Man, Mitsubishi / Fuso Canter and Fighter, Mercedes, Volvo, Western Star, Caterpillar, John Deere, Case and many more. We supply Black Duck Canvas & Denim Seat Covers suitable for use with major Brands for Aftermarket Seating including Isri, Grammer, Stratos, Recaro, KAB & National. Miller Canvas also supplies Topaz Global Canvas Seat & Tank Covers suitable for a wide range of ATV, Motorbike & UTV'S. Suitable for use in brands such as Can-Am, CF Moto, Honda, Kawasaki, Kymco, Polaris, Suzuki & Yamaha all 100% Australian Made shipped direct to you from our supplier via Express Post. Miller Canvas has no affiliation with or endoresment by any of preceding brands or their authorised distributors or dealers. Miller Canvas is an authorised reseller of Black Duck Seat Covers - Topaz Global Seat Covers and Ozroll products. As well as our extensive range of Vehicle Seat Covers, we sell Accessories such as Bungee Loops, Cords, Buttons, Hooks, Eyelets, Lift-the-dot Fasteners, Stayput Fasteners, Saint Parts, Press Studs & Tools for fitting and repairs to Tonneau Covers, Tarpaulins and for general Canvas Repairs. We sell a range of Genuine Ozroll Roller Shutter Spare Parts & Components such as Replacement Batteries for Ozroll ODS Controllers, replacement motors and Ozroll E-Port Controllers, as well as DIY Ozroll Roller Shutters that can be delivered Australia Wide. Someone in Brisbane bought a Black Duck Seat Covers MANITOU TELEHANDLERS MT732, MT845, MLT845-120LSU KAT1ST 1 Hours ago. Someone in Mudgee bought a SPRING FASTENER 130mm BLUE Part # 11.830.414 2 Hours ago. Someone in Brighton bought a ODS Control 10 Replacement Battery (Genuine component) 15.260.000 This battery fits ALL Ozroll ODS Controllers, Smart Drive & Smart Control 10 including RF models. 7 Hours ago. Someone in Darwin bought a Black Duck Seat Covers for Front Driver & Passenger Bucket Seats. Suitable for Toyota Landcruiser VDJ76 4 Door Wagons from 03/2007 - 08/2016. 1 days ago. Someone in Cardup bought a ODS Control 10 Charger Suits ALL ODS 10 & E-Port Controller (Genuine Ozroll components). 1 days ago. Someone in Cardup bought a E-Port Conversion Kit (Genuine Ozroll components). PLEASE NOTE, this kit does not include the E-Port controller: 1 days ago. Someone in Cardup bought a Ozroll E-Port Controller 15.600.001 - replaces the old ODS or Smart Control 10 (If upgrading you will need a conversion kit) It is recommended to purchase a new charger. 1 days ago. Someone in Sutton bought a Black Duck Seat Covers - Double Cab Front Seats ONLY - suitable for VDJ79 Landcruiser - from 2012 onwards until 2017 UPGRADE in 08/2016. 1 days ago. Someone in Tura Beach bought a Black Duck Seat Covers - Double Cab Front & Rear - suitable for VDJ79 Landcruiser - from 2012 onwards until 2017 UPGRADE in 08/2016. 1 days ago. 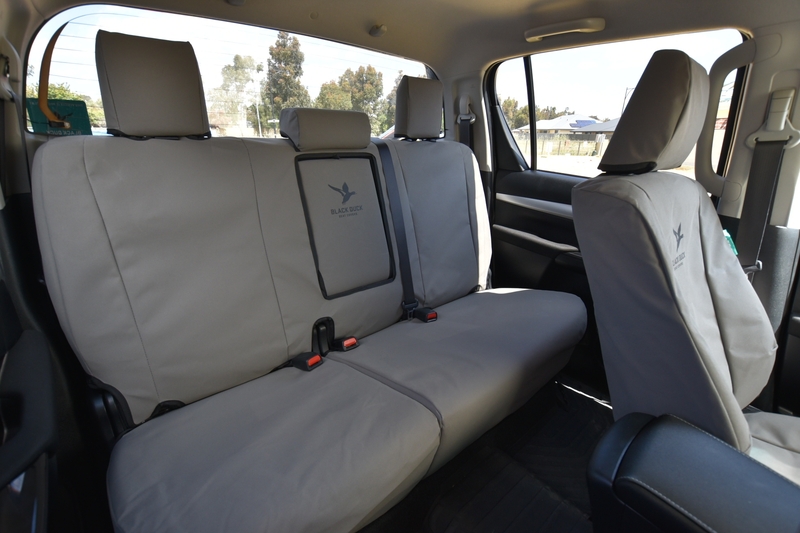 Someone in Peregian Beach bought a BLACK DUCK SEAT COVERS - Dual Cab COMPLETE Front & Rear - Suitable for TOYOTA LANDCRUISER 70 series VDJ79 2017 UPGRADE from 09/2016 onwards " Current Model ". 1 days ago. Someone in sydney bought a ODS Control 10 Charger Suits ALL ODS 10 & E-Port Controller (Genuine Ozroll components). 1 days ago. Someone in Sydney bought a Black Duck Seat Covers - Front Driver & Passenger Buckets (Set) suitable for Toyota Hilux Workmate & SR Utes - W/OUT Seat-Fitted Airbags: Warning: These vehicles may be fitted with SEAT-FITTED AIRBAGS please check. 1 days ago. Someone in BAYSWATER bought a Black Duck Seat Covers - SR, SR5 DUAL CAB COMPLETE - Suitable for TOYOTA HILUX SR & SR5 - NOT WORKMATE - from 07/2015 onwards. 1 days ago. Someone in Baulkham Hills bought a ODS Control 10 Replacement Battery (Genuine component) 15.260.000 This battery fits ALL Ozroll ODS Controllers, Smart Drive & Smart Control 10 including RF models. 2 days ago. Someone in Tamborine bought a BLACK DUCK SEAT COVERS - Driver & Passenger Buckets - suitable for TOYOTA LANDCRUISER 70/79 Series "CURRENT MODEL" - WORKMATE, GX, GXL, LC MILITARY - SINGLE CABS ONLY from 09/2016 onwards. 2 days ago. Someone in Toongabbie bought a Black Duck Seat Covers - Fronts and Rear - suitable for Toyota Landcruiser 70 SERIES VDJ76 - WORKMATE & GXL 4-DOOR WAGON 2017 - current model. 2 days ago. Someone in Canberra bought a ODS Control 10 Charger Suits ALL ODS 10 & E-Port Controller (Genuine Ozroll components). 2 days ago. Someone in GLENCOE bought a PX2 & PX3 Ford Ranger Dual Cab Complete Front Seats & Rear Bench with armrest. XL, XLS, XLT, FX4 & WILDTRAK from 06/2015 onwards. Black Duck Seat Covers 2 days ago. Someone in Sydney bought a BLACK DUCK SEAT COVERS - Dual Cab COMPLETE Front & Rear - Suitable for TOYOTA LANDCRUISER 70 series VDJ79 2017 UPGRADE from 09/2016 onwards " Current Model ". 2 days ago. Someone in Gold Coast bought a Driver and Passenger Buckets LDV G10 Vans with Single Inner Armrest provision and Covers on both. Black Duck™ Canvas & Denim seat covers. 3 days ago. Someone in Willetton bought a Standard Box End Insert Guides (Square or Round Hood Boxes) 3 days ago. Someone in Willetton bought a SPRING FASTENER 170mm Grey Part # 11.831.402 3 days ago. 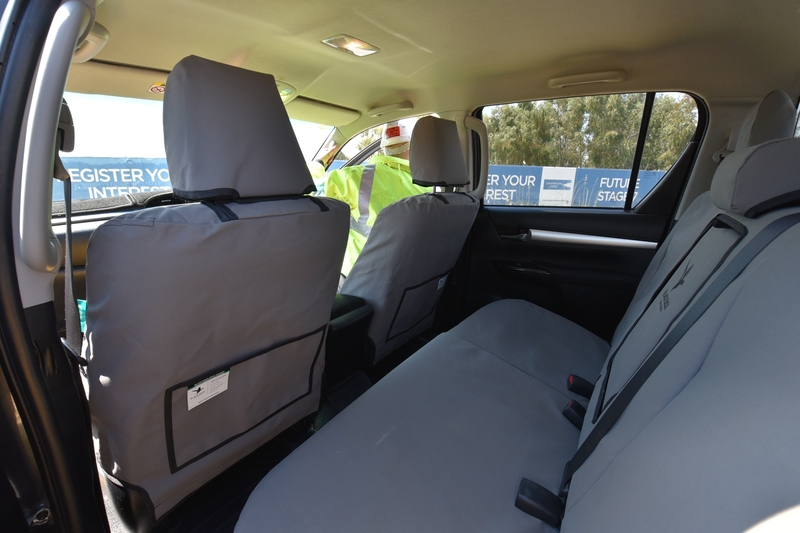 Someone in canberra bought a PX2 & PX3 Ford Ranger Dual Cab Complete Front Seats & Rear Bench with armrest. XL, XLS, XLT, FX4 & WILDTRAK from 06/2015 onwards. Black Duck Seat Covers 3 days ago. Someone in Clarence Town bought a LTF400 KINGQUAD SUZUKI ATV 2008 onwards Heavy Duty Canvas Seat Cover 4 days ago. Someone in Deer Park bought a E-Port Conversion Kit (Genuine Ozroll components). PLEASE NOTE, this kit does not include the E-Port controller: 4 days ago. Someone in Deer Park bought a E-Port Conversion Kit Bundle: Consists of - 1 x RSE-PORTKIT, 1 x E-PORT Controller with Lithium Batteries (Non rf). 1 x CHARGER suited to the Lithium Batteries. 4 days ago. Someone in Thornlie bought a E-Port Wall Plate 15.551.001 4 days ago. Someone in Thornlie bought a E-Port Conversion Kit Bundle: Consists of - 1 x RSE-PORTKIT, 1 x E-PORT Controller with Lithium Batteries (Non rf). 1 x CHARGER suited to the Lithium Batteries. 4 days ago. Someone in INNISFAIL bought a BLACK DUCK SEAT COVERS - Driver Bucket & Passenger 3/4 Bench (3 seater) - suitable for LANDCRUISER SINGLE CAB HZJ79 & VDJ79, 70/79 series (from 10/1999 - 07/2009) (see description). 4 days ago. Someone in Bonbeach bought a ODS Control 10 Replacement Battery (Genuine component) 15.260.000 This battery fits ALL Ozroll ODS Controllers, Smart Drive & Smart Control 10 including RF models. 5 days ago.